Qubole offers features that provide good network perimeter security while performing data analysis. Here is a data flow diagram of QDS. In general, Qubole endpoints are accessible from anywhere worldwide through HTTPs and that applies to browser-based access as well as API-based access. The access can be limited to specific IP addresses. A common way of arranging this is, for example, to put all machines that may access Qubole in a private network/VPN and whitelisting the IP address of the NAT gateway so that only members logged into the VPN can access Qubole. Whitelisting one or more IP address is a feature that Qubole offers if you want a single or a fixed number of IP addresses to be used for accessing the QDS account. Create a ticket with Qubole Support to enable this feature for the QDS account. Once you add IP addresses to whitelist, logging in to QDS is possible only from the whitelisted IP addresses. For more information, see Whitelisting IP Addresses. Qubole now supports only HTTPS. All HTTP requests are now redirected to HTTPS. This is aimed at better security for Qubole users. It is applicable to all the Clouds that QDS supports. For AWS, Qubole encrypts data at rest on S3 to prevent unauthorized access to the S3 data. You can enable server-based encryption as described in Enabling the Server-side Encryption in QDS (AWS). Enabling the Client-side Encryption (AWS) describes how to enable encryption on the AWS client side. On Azure, data at rest is encrypted by default; see Encryption for Data at Rest on Azure. Airflow: Data traffic is not applicable to an Airflow clusters. Hadoop 1: Set fs.s3.https.only=true as an Hadoop Override to encrypt data transit to an AWS S3 location. Hadoop 2 (Hive) and Spark: set fs.s3a.connection.ssl.enabled=true as an Hadoop Override to encrypt data transit to an AWS S3 location. Presto: Set hive.s3.ssl.enabled to true to secure the communication between Amazon S3 and the Presto cluster using SSL. Airflow: As Airflow is a single-node cluster, data traffic among cluster nodes is not applicable to it. 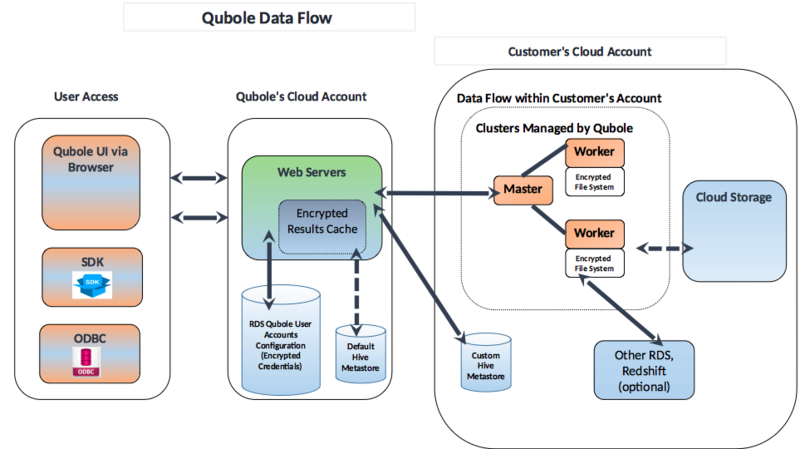 Hadoop 1: Qubole does not support data traffic encryption within an Hadoop 1 cluster. Hadoop 2 (Hive) and Presto: Encrypting Communication within a Presto Cluster describes how to encrypt the data among Hadoop 2 (Hive) cluster nodes or Presto cluster nodes. Spark: Encrypting and Authenticating Spark Data in Transit describes how to encrypt the data in transit on Spark cluster nodes. An AWS-VPC allows you to customize the network configuration and thus you have complete control over the virtual network. You can use IPv4 and IPv6 to securely and easily access resources and applications.Qubole supports configuring clusters in an AWS Virtual Private Cloud (VPC). It also supports AWS VPCs with private and public subnets. Configuring clusters in an AWS VPC with private and public subnets ensures the data security that is processed on the QDS platform. You can secure the data export/import from/to the QDS platform in VPCs. For more information on how to configure a cluster in an AWS VPC, see Configuring a Cluster in a VPC with Public and Private Subnets (AWS). Unless you open the SSH port to the world, you must use tunnels to communicate. For details, see Securing through SSH Tunnelling. Enable Qubole tunnel server settings on the cluster when it is in a VPC unless you want to open the SSH port to the world. Tunnelling with Bastion Nodes for Private Subnets in an AWS VPC lists the IP addresses of the Qubole tunnel servers. Once tunnelling is enabled on the cluster, it is automatically used for data export/import and running commands and so on as before. It is highly recommended to use a tunnel and not open SSH to the world. For more information on the ports that allow inbound traffic, see Understanding Cluster Network Security Characteristics (AWS).